What happens when you remove the winemaker from the equation of making wine? Well technically nothing happens, no wine, just raisins. But consider this. What would happen if a group of Lodi winemakers got together, sourced Zinfandel from heritage plantings within the Lodi AVA, agreed to a specified winemaking protocol using what the group describes as “minimalist winemaking practices” to eliminate the winemakers’ personal style, then submitted their wine individually to the group for approval by all members? A lot of hand wringing, heated debate, sleepless nights… yes, almost certainly. But in the end what resulted is a collection of six very special Zinfandels clearly expressive of each vineyard. 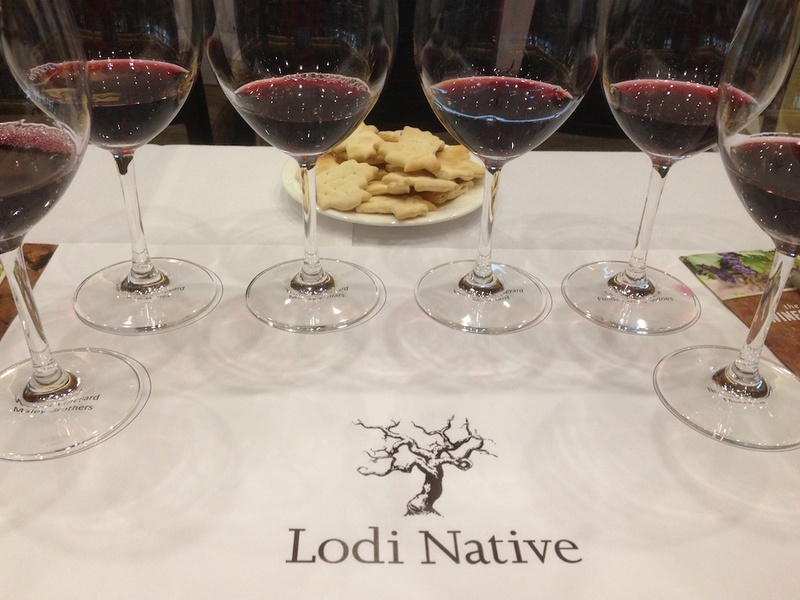 The seed for the Lodi Native project was planted in January 2012 when Randy Caparoso, sommelier and blogger for LoCA (the Lodi Winegrape Commission) gathered together a group of Lodi winemakers to taste their wines with a visiting New York sommelier. From that tasting, a discussion followed as to how Lodi might best highlight its historic Zinfandel vineyards. The goal of producing the most vineyard-expressive Zinfandel possible emerged. The emphasis was to be on the vineyard and the variety, not the winemaking style. A winemaking protocol was established. Native yeast fermentation only and no inoculation for malolactic fermentation. No adjustment to acid levels. No addition of water or other methods of alcohol reduction. No new oak. “Old vines” (prior to 1962) preferred. Six winemakers agreed to participate in the Lodi Native project. For some of the winemakers in the group this protocol represents a significant departure from their normal winemaking practices for others, not as much. All committed to making wine following this protocol, stepping outside of their usual comfort zone. Six vineyards, all located within the Mokelumne River sub-AVA of the Lodi AVA are represented in this inaugural bottling. 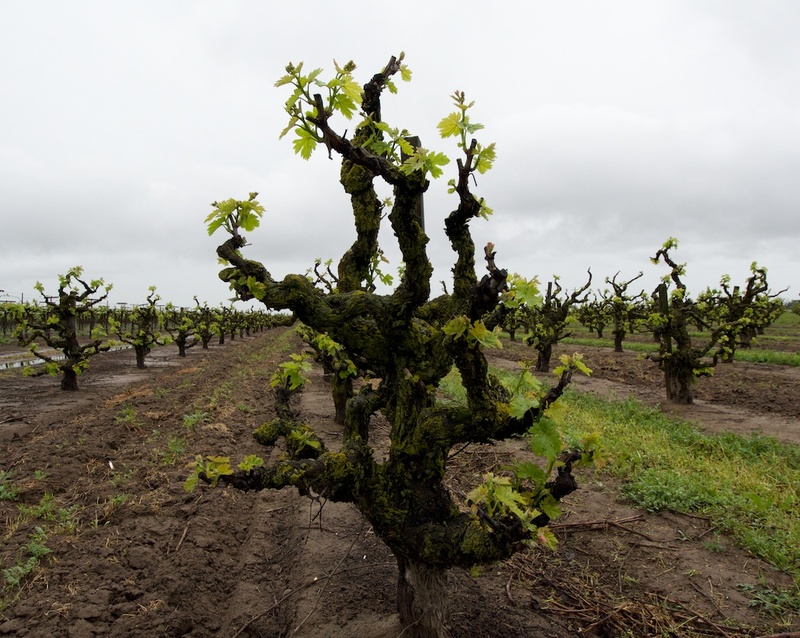 The Mokelumne River area is the historic heart of Zinfandel in Lodi, with original plantings dating back to the 1800s. The oldest existing vineyard was planted in 1888. The soil is mostly Tokay sandy loam, with some variation. Soil in the eastern portion of the AVA (east of Hwy 99) tends to be deeper, sandier soil. In the western portion, the sandy soil tends to be shallower and contain more organic matter. 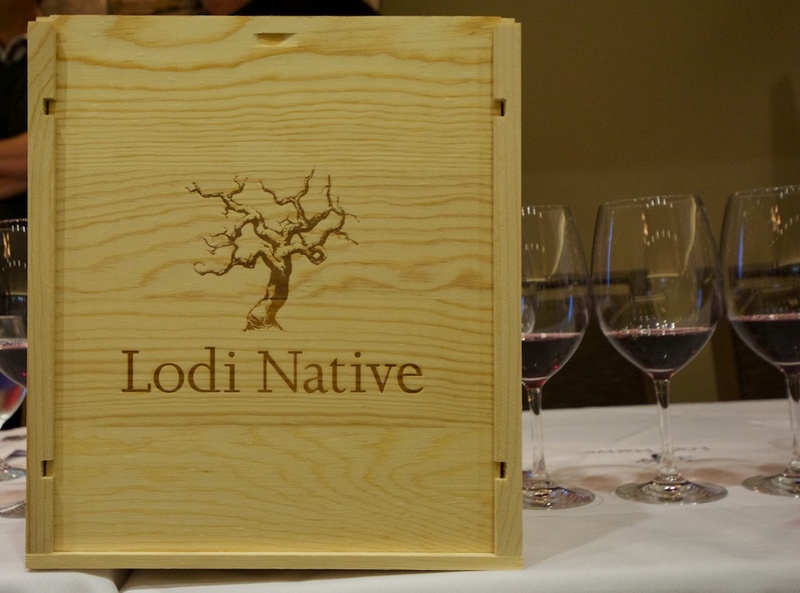 The Lodi Native project and its wines were presented to the public for the first time on March 29. Zinfandel Advocates & Producers (ZAP) and Lodi Winegrape Commission hosted the presentation which included an educational seminar, escorted vineyard tours, winemaker reception and BBQ-themed dinner. The vineyards were wet, but beautiful, due to the rainy day. It was a great opportunity to hear the grape growers and winemakers talk about the vineyards and the process. We attended as media representatives (thank you Charles Communications Associates) and are excited to share our experience. Wegat Vineyard — farmed by Todd Maley, this 21 acre Zinfandel vineyard was field grafted by Todd’s dad and uncle in 1958 and yields about 3 tons per acre. Todd typically does shoot thinning to assure optimal sun exposure and ripe flavor development. He will drop 20 – 30% of the fruit. Todd feels the most important factor in developing the concentrated fruit flavors he prefers is withholding water from the vines in May and June. The vines produce smaller berries and a uniform crop with riper flavors. 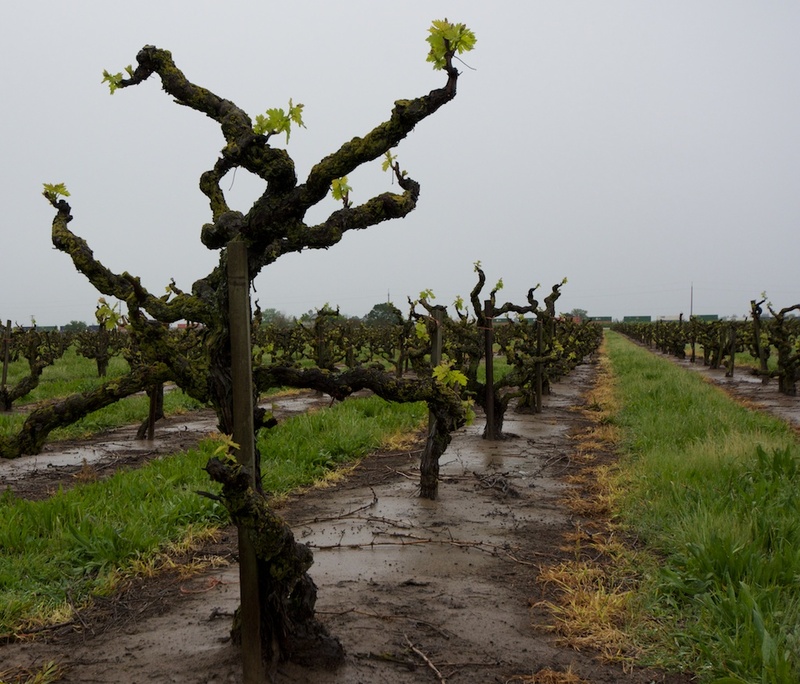 The vineyard is farmed according to Lodi Rules of sustainable farming. Chad Joseph decided early in his winemaking career he wanted to work in Lodi, particularly with Zinfandel. He is the winemaker for Maley Brothers Vineyards, a small “handcrafted, growers label”, and therefore is familiar with the fruit produced by the Wegat Vineyard. He chose to harvest at a lower Brix to facilitate a smoother native yeast fermentation. Also, a bit of sulfur was added to inhibit non-Saccharomyces yeast. Light destemming followed with as many whole clusters as possible. Chad feels whole cluster fermentation (carbonic maceration) accentuates the berry flavor of the fruit and adds herbal notes. Fruit was stored, covered, at 45º for 6 days during which time the cap developed. At that time, the cap was gently punched down and the fruit moved to a warmer portion of the cellar. Over the next 7 days, fermentation took place and when the temperature rose to about 85º – 88º the bins were moved to an area of the cellar that is not temperature controlled. Fermentation completed very quickly. Fruit was pressed and moved straight to barrels on the pressed lees. After a month, with malolactic fermentation completed, the wine was racked and returned to barrel with a bit of sulfur. “That’s all we did,” Chad modestly stated. He described the process as a learning experience that allowed him to grow as a winemaker. He was happy to participate. Soucie Vineyard — the most westerly vineyard of the group, this 6 acre vineyard was planted in 1916. It is own-rooted, head-trained and planted in debris sandy loam. 90% of the original planting remains, some vines are held together with bailing wire and ropes. The soil has a lower organic content than Tokay sandy loam and a high quartz content. The Zinfandel fruit from this vineyard, located only about a mile from the Wegat vineyard, produces much larger bunches of grapes with larger berries. Clusters can weigh a pound-and-a-half. m2 Wines winemaker Layne Montgomery has been making wine from this vineyard since 2002. By his own account, it took him 7 or 8 years to figure out this vineyard. In his estimation the Soucie vineyard consistently produces a deep, rich forest floor characteristic in its wines. He feels it is one of the best Zinfandel vineyards in California. Layne described himself as probably the most skeptical winemaker of the group. He admitted that he did not liking giving up control over the grapes. Because of the need to use a native yeast fermentation and the inability to acidify, he picked half the Zinfandel at 22º Brix, lower than he would like. As he put it, “The grapes sat in the bin for 6 days before starting fermentation, mocking me.” He harvested an additional half-ton at 25º Brix and then blended the two batches. He had no issue with un-inoculated malolactic fermentation. 2012 Lodi Native m2 Soucie Vineyard Zinfandel — lighter red fruit flavors of cherries, some sweetness and spice mixed with earthy notes, smooth tannins, good acidity. This wine has a light body for such a full-flavored red wine. The finish is so long with flavor, the wine just becomes almost weightless but the flavors remain. Very nice. ABV 14.5%. Trulux Vineyard — this 30 acre Zinfandel vineyard is planted on St. George rootstock and is farmed in accordance with Lodi Rules. These very tall vines, at nearly 6’ in height, produces long, scraggly open clusters of grapes with small berries. McCay Cellars winemaker Michael McCay is able to spot-pick the Trulux vineyard, enabling him to choose only fully-ripe clusters. The fruit varies considerably on these tall vines, with fruit growing at between 1 and 6 feet above the ground. Michael McCay first made wine from this vineyard in 1994…in a barn. He fell in love with the vineyard right away. Of all the winemakers in the Lodi Native project, he is probably the most comfortable with the Lodi Native protocol. His commercial production of Zinfandel for McCay Cellars is 85% native yeast fermentation. He picks according to pH more than ripeness, though one does follow the other. Wine from the Trulux vineyard takes time to show its true potential, according to Michael, typically 12 – 18 months. For his commercial bottling, 2010 is the current release and the 2011 Trulux Zinfandel was just bottled last week. Patience is required, but rewarded. 2011 Lodi Native McCay Cellars Trulux Vineyard Zinfandel — dark fruit and earthy aromas are echoed in the flavors along with leather. Tannins are smooth with good acidity and once again, a very long finish. The flavors are darker, almost brooding. Delicious. ABV 14.6%. Marian’s Vineyard — this 8.3 acre vineyard was planted 1901. It is own-rooted and planted in deep, sandy soil. Technically located on the west side of Hwy 99, its soil is more characteristic of the east side Mokelumne River AVA’s deep sandy soil. As winemaker Stuart Spencer noted, they don’t like to choose sides! As part of the Mohr-Fry Ranch, Marian’s vineyard is farmed by father-son team of Jerry and Bruce Fry. This lovely old vineyard, which is farmed according to Lodi Rules, is one of the best known in Lodi. The origin of its budwood remains unknown. Marian’s vineyard continues to produce 3 to 4 tons per acre in good fruit years. This level of production is surprising to me given its age, and surely a testament to the farming practices of Jerry and Bruce Fry. The Spencers, Stuart and his father Tim before him, have a longtime relationship with Jerry and Bruce. Back in 1996, when St. Amant Winery was faced with the destruction of their vineyards by phylloxera, Tim Spencer first made Zinfandel from the Mohr-Fry vineyards. The Frys provided the fruit from a block planted in 1944 in exchange for some of the wine. Without regard for payment for the fruit, their agreement was sealed with just a handshake. In 1999 Tim approached Jerry wanting to make wine from what Jerry considered his best block, Marian’s vineyard. That was the first vintage of Marian’s vineyard produced by St. Amant Winery and it has been a huge success for the winery since. It is this kind of longtime relationship that Stuart feels characterizes the spirit of St. Amant Winery and the Lodi winemaking community in general. Stuart chose to pick fruit from Marian’s vineyard for the Lodi Native project at a bit lower Brix than usual. He said the fruit came into the winery a bit hot and the fermentation got “funky” and was not a success. He picked a second batch at the more usual 24.5º Brix and that native fermentation proceed without problem. He admitted to some anxious days, waiting for that fermentation to get started. Stuart stressed that the collaborative process involved in Lodi Native, though challenging at times, has been a great experiment. He has learned a lot from it, and will continue to experiment with native fermentation. He can see the potential for using a combination of native and commercial yeast fermentations to enhance the flavor profile of his commercial bottling. 2012 Lodi Native St. Amant Marian’s Vineyard Zinfandel — light aromas of dark berries. Berry pie flavors, a bit of spice and pepper and a touch of earth combine with smooth tannins and good acidity. Another long, flavorful finish. Just delicious. ABV 14.5%. Century Block Vineyard — this 3 acre block located on the east side of the Mokelumne River AVA was planted in 1905 on its own roots. It is a tiny island among cherry orchards and Zinflandel on wire trellising that is used for bulk production. The soil is very sandy, poor in nutrients and well drained. In Ryan’s opinion, meticulous vineyard management was a key to the success of this project. When making wine without a safety net, as with the Lodi Native project, quality fruit is essential. He applies a compulsive attention to shoot thinning, sucker removal and fruit thinning. Ryan harvested at 23 to 24.2º Brix. Ryan is the winemaker with the least amount of experience in the group. His winemaking experience began in 2008 and Fields Family Wines’ first vintage was 2010. His production remains relatively small at 1600 cases. To his knowledge the 2012 Lodi Native bottling is the first wine produced as a vineyard designate from the Century Block vineyard. That makes this wine even more special. Unfortunately, he lost the contract for fruit from this vineyard in 2013. In spite of the challenges of winemaking according to the Lodi Native protocol, the experience was a worthwhile one for Ryan. It did offer an opportunity to produce a wine purely characteristic of the vineyard, even if only one-half of his production made it into the final bottling. Definitely not a money-making proposition. 2012 Lodi Native Fields Family Century Block Vineyard Zinfandel — delicate cherry aromas followed by dark cherry flavors and a bit of spice and pepper. Smooth tannins, good acidity and a medium body combine with pleasing fruit flavors for a very long finish. Fresh and juicy. ABV 14%. Shoot thinning and cluster thinning are generally not needed in this vineyard. The very small yield produces concentrated flavors with very high acidity even when very ripe. Typically the pH remains less than 3.4 even at 28º Brix. This high acid characteristic makes is possible to dry-farm this vineyard and achieve physiologic ripeness. This suits Tim’s winemaking style just fine. Tim, who is winemaker/owner of Macchia Wines, feels the Lodi Native project is the natural evolution of winemaking in Lodi. He described how Lodi has been the engine driving wine production in California by producing a very large volume of grapes used for mostly bulk wines. Over time a number of family wineries have grown up in Lodi. Finally, winemaking has moved to this project which is able to showcase some very unique and special vineyards in Lodi. Being “handcuffed” as a winemaker by the Lodi Native protocol was challenging for Tim. He was skeptical, especially given his beer brewing background, he naturally relies on the contribution yeasts make to the fermentation process. But, in the end Tim is pleased to be able to produce a wine that represents this special vineyard. In his view this wine reflects exactly what he tastes as he walked through the vineyard tasting the fruit before harvest. A sense of place. Tim, picked three batches of grapes from different vineyards for the Lodi Native project. He chose the best batch and that’s what is in the bottle. 2012 Lodi Native Macchia Noma Ranch Zinfandel — a obvious spicy, floral nose is followed by very concentrated, dark fruit flavors, spice, significant tannins and juicy acidity. Lots of dark fruit flavor, lots of texture. ABV 15.8%. Wow, what a flavorful group of wines. Similar fruit flavors were common to these wines, but each tasted unique. We were favorably impressed with the depth of flavor, great acidity and generally very long finish of these wines. There were no under ripe flavors. Not one wine in this group was thin or lacking in flavor. Every one of these wines was so pleasing to drink on its own. None was heavy, ponderous or overly alcoholic. I can imagine everyone of these wines will be very good food wines. No wood aging…no problem. Every one of these wines had lots of flavor, great tannin structure and elements of spice or earth from the fruit itself. Just delicious on its own. The challenges of slow, unpredictable native fermentation and its unsuitability for a large volume production facility was noted by several of the winemakers, so we won’t look for it from large producers. But, that presents an opportunity for small, artisanal producers. No only is Native Lodi a demonstration of some of the area’s most aged and unique vineyards, it is a demonstration of the power of cooperation and comradery among this group of Lodi winemakers. It’s so refreshing to see in a competitive commercial market. These elegant, flavorful wines with restrained use of oak and great acidity should have the potential to age well and perhaps gain complexity with time. It would be interesting to taste these wines again over time. The Lodi Native project continues…all winemakers in the group produced a Lodi Native wine in 2013 and expect to do the same in 2014. Will the number of winemakers participating in Lodi Native increase? That remains to be seen. Six bottles of the 2012 Lodi Native Zinflandel presented in a wooden box and priced at $180 will be available at the Lodi Wine and Visitors Center. Additional information is available on the Lodi Native website as well. Thank you to Zinfandel Advocates & Producers (ZAP) and Lodi Winegrape Commission for organizing the tasting, vineyard tour and dinner. The day was informational and fun, even if somewhat soggy. We enjoyed the vineyard tour in spite of rain showers, the vineyards were beautiful in the rain. Thanks also to Charles Communications Associates and Alex Fondren. Finally, a tip of the hat to this group of Lodi winemakers who were willing to work together to make wine outside their comfort zone. Your project is a success, and you are all still smiling! Well done!